At a glance some say, "they're twins!" In the picture above note that the JK-05 Junior has a wing strut. Wing Span = 10.76 m / Speed: Vmax is = at 220 Kph, Vc Cruise is 180 Kph & Vs0 Stall is 65 Kph / The Vz climb rate is 6 m per sec | 86 or 100 Lt in dual Wing Tanks. Wing Span = 10.68m / Speed: Vmax is = at 220 Kph, Vc Cruise is 160 Kph & Vs0 Stall is 55 Kph / The Vz climb rate is 5.5 m per sec. Fuel Capacity = 70 Lt in dual linked tanks behind the seats. The Topaz employs large forward hinging doors with 2 x 15kg baggage lockers behind the seats with outside external access on both sides of the fuselage. The JK-05' has a "gull-wing" style canopy entry/exit opening system with 2 x 7kg baggage lockers situated above and behind the pilot/passenger. The Topaz is fitted with a single section full length cantilever wing whereas the JK-05 has a two piece wing that is purposely tapered towards the cockpit to increase visibility supported by a single strut. The Topaz is powered by the Rotax 912uls 100hp engine with separate flaps & ailerons plus 86 liter wing tanks which includes an 8 liter reserve fuel tank whilst the JK-05 uses the standard Rotax 912ul 80hp engine with a full length flaperon and 2 x 35 liter fuel tanks mounted behind the seats. On both models flap and trim controls are push-button operated and both models easily meet and often exceed their individual performance specifications - even at high altitude! 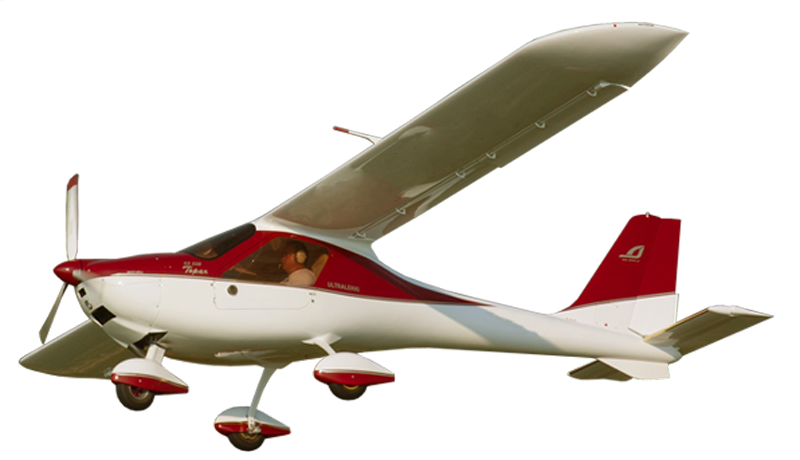 This glider heritage mated to a full composite structure offers wonderful visibility, great range and superb comfort. Both these aircraft are manufactured from vinyl-ester resins and composite parabeam which have far better thermal resistance qualities to the more conventionally used epoxy resins. The 120cm wide cockpit on both can also accommodate very large men comfortably which is unusual in many European designs. The comprehensive standard analog instrument panel is equipped with far more than just basic instrumentation and can also be fully customized to individual specifications using any number of different panel layouts and avionic options. Both aircraft feature a very strong composite sprung landing gear with hydraulic disc brakes that are activated via the single brake lever with parking lock convenience attached to a center control stick. The JK-05 and Topaz are not cheerfully painted clones of someone else's design, neither are they compromised by questionable slow speed handling characteristics or marginal STOL performance. You also will not find fabric covered surfaces on either model to offset weight considerations and both models will reward the individual who appreciates fine handling and balanced controls. The wing design delivers spectacular climb rates and a phenomenal glide ratio and at MTOW both the JK-05 and Topaz achieve what very few other designs can at high altitude using conservative power settings. The 2016 TOPAZ was launched in Germany at the Friedrichstein Air Show in Germany. Several new Topaz features will instantly appeal to any LSA enthusiast who is in the market for a sport plane that can compete with the very best. Stunning good looks aside, the new Topaz now has 86 liter wing tanks, with an optional 100 liter capacity and/or the Rotax 912is 100hp fuel injected motor mated to a constant speed propeller if required. With a substantially increased baggage allowance that now features external lockable access on either side of the fuselage the Topaz can of course be factory equipped with a ballistic parachute. In keeping with an LSA of this class the lightweight Beringer hydraulic brake system is also available, as is the fully integrated Kanadia class cockpit with full auto pilot functionality that includes electronically controlled elevator and rudder trim. Tested in France the new Topaz achieved staggering 1750ft/min climb rates and cruise speeds in excess of 115 knots at 5000 RPM. With panoramic visibility and large doors for effortless access the Topaz offers substantially more than anything else in this category and at a very competitive rate. Our Pricing Pricing, Magazine Reviews and more are on our blog. Click here to link to the blog.